How well does it really overclock? Rather than trying to overclock my single CPU sample on an unfamiliar chipset and motherboard and draw a conclusion that would be useful, wouldn't you rather know the results from someone who's already tried overclocking a ton of them? That's what motherboard company Asus has done to help tune its automatic overclocking routines for Skylake. Taking the results of what it achieved after trying to overclock trays of CPUs, Asus produces its pre-launch forecast that's usually an accurate predictor for what consumers can overclock to reliably. You can basically expect to hit 4.6GHz to 4.7GHz with a retail Core i7-6700K chip, the company says. The absolute best samples will push 4.8GHz. That's actually a slight improvement over Haswell, which topped out at 4.5GHz on liquid cooling for most. Higher usable overclocks were few and far between, and many had worse overclocking experiences with Haswell, so Skylake is indeed an improvement. The only real disappointment will be for those who bought into the leaked stories that Skylake would hit 5.2GHz on air cooling -- not even liquid cooling -- and believed it would translate into an experience for all. If Asus' data is correct (and there's nothing to indicate otherwise), the only 5GHz overclocks will live in your memories of Intel's Sandy Bridge CPUs. As a consolation prize, you should know Asus' forecast says Skylake CPUs can hit DDR4/3600 clock speeds with all four DIMM slots filled on a good motherboard (ahem -- from Asus, natch). We used this Asus Z170-Deluxe with the new Z170 chipset for the bulk of our testing. The real star here is the Z170 chipset. The Robin to Skylake's Batman, Z170 is probably just as important for what it finally fixes in the limitations of the chipset it replaces. 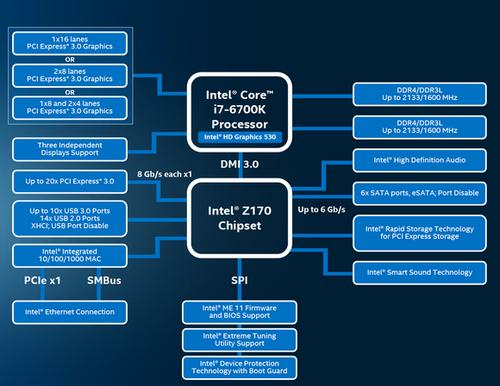 Like Haswell, Skylake features just 16 PCIe Gen 3 lanes in the CPU. Any additional PCIe lanes come from the chipset. In Haswell's Z87 and Z97 chipset, the limit was just 8 PCIe Gen 2 lanes, which hadn't changed since 2011's Sandy Bridge chipset. In 2011, that was probably fine, but today, that's not enough expansion for modern PCs with fast M.2 drives, SATA Express drives, and USB 3.1. Even worse, to get more bandwidth to run high speed devices such as, say Intel's 750-series SSD, you had to steal bandwidth from the GPU. With Z170, Intel is finally, finally stepping up and giving the chipset up to 20 PCIe Gen 3 lanes. Because increasing the water pipes to your home without increasing the size of the water mains would be worthless, Intel is also doubling the interconnect from the CPU to the chipset. The new DMI 3.0 in Z170 offers up to 40Gbps using an x4 PCIe Gen 3 link. The Z97 used a 20Gbps x4 PCIe Gen 2 link. 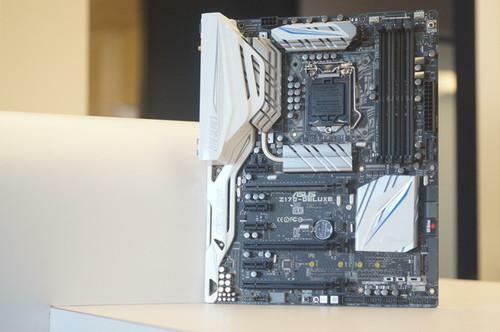 Skylake’s biggest contribution to desktops will be the Z170 chipset that adds PCIe Gen 3. The upshot is that with Z170, you can run your graphics card at full bandwidth while still having a super-fast PCIe or M.2 SSD or multiple SATA SSDs along with your your 10Gbps USB 3.1 devices, without sacrificing performance as you would with older chipsets. And no, it doesn't actually support native USB 3.1. That's added through third-party chipsets only. This may seem like a long discussion of plumbing, but believe me, the Z170 is a welcome refresh for Intel's consumer chipsets, one that's long overdue. Numbers don't lie -- keep reading for hard performance data on Skylake.